Mindhunter (R) is an American crime drama television series. This TV show is based on the true crime book Mindhunter: Inside the FBI’s Elite Serial Crime Unit written by John E. Douglas and Mark Olshaker. Set in 1977 an agent in the FBI’s Elite Serial Crime Unit develops profiling techniques as he pursues notorious serial killers and rapists. Set in 1977 – in the early days of criminal psychology and criminal profiling at the Federal Bureau of Investigation. 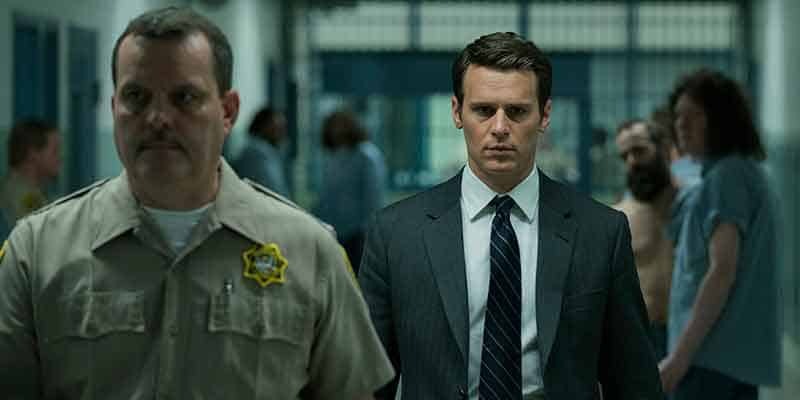 Mindhunter revolves around FBI agents Holden Ford and Bill Tench, along with psychologist Wendy Carr, who interview imprisoned serial killers in order to understand how they think with the hope of applying this knowledge to solving ongoing cases. This TV show is a Netflix Original. The TV show can only be found there. Netflix is an on-demand streaming service. Netflix lets you binge-watch entire seasons of the crime drama. This is a very inexpensive way to catch this amazing TV show as plans begin at $7.99/month. To learn more about this service read our Netflix review. This TV show can be found on just about any streaming device on the market. You can stream on a tablet, smart phone, gaming console, desktop, or a streaming device such as a Roku, Apple TV, Chromecast, AirTV, Amazon Fire TV, and more. Here are some of the top devices that can be used to access one of the services that carry Mindhunter. To learn more click on the icons below or read our streaming device guide. Mindhunter can be streamed using a VPN. A VPN can unlock content from services such as Netflix and fuboTV. You can bypass blackout restrictions and geo-blocking. A VPN will increase your online security and protect your online devices. This is very useful in the United States but is even more useful internationally. By using a VPN you can view this TV show while in another country. Not every VPN is created equally so we have chosen a few that we believe to be the best VPNs to pair with streaming services such as: ExpressVPN, NordVPN, and CyberGhost VPN.